Welcome back to the Virtual Book Club for kids. Each month I join with a group of bloggers to feature book activities from books by a selected author. This month we are featuring the works of Denise Fleming. I've chosen "In the Tall Tall Grass" by Denise Fleming. It's a wonderful pick for spring reading. Spring has sprung in our yard. Our grass is green, tall, and full of interesting creepy crawlies. The book "In the Tall Tall Grass" partners well with our outdoor explorations. 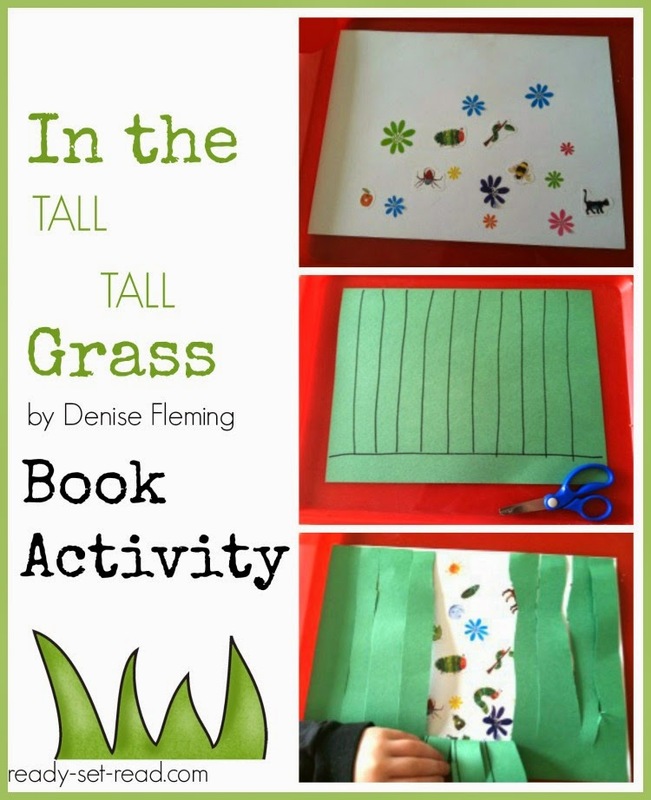 This book explores the tall tall grass from the perspective of a caterpillar. The book explores the daytime critters as well as the nighttime critters. It has great descriptive rhyming text. It provides opportunities for children to label and count a variety of grassland critters such as hummingbirds, bees, moles, snakes, fireflies, bats, and more. in the great outdoors as we counted plants and bugs. We also used vocabulary from the book to label bugs and birds and talk about the movement of the animals. When we returned inside, we made our own tall tall grass craft. I gave Tyson a set of stickers. These were from a set of Eric Carle stickers that I found several months ago. Any bug or animal sticker would work for the activity. We also used some flower stickers. Children could also draw their own critters. We placed the stickers on one sheet of paper. To create the tall tall grass, we snipped the green paper. I drew lines for Tyson to follow so he would know where to stop. I wanted him to leave a small section at the bottom of the page. We glued the two papers together and the stickers were hidden in the tall tall grass. I reinforced the concepts of labeling objects using story vocabulary and counting objects as we explored Tyson's tall tall grass. In the Tall Tall Grass is a great book and it's loved by all members of our family. If you'd like to see more ideas for Denise Fleming books, visit these blogs. Link up your own post ideas below. Share your favorite crafts, recipes, and activities to go with Denise Fleming books. Next month we'll be exploring books by Mem Fox. Great activity! And I say that because I just shared pretty much the SAME thing for a weekly series I participate in... Fine Motor Fridays. Wow! Great minds think alike!